Construction got under way Wednesday in La Jolla on a six- story medical office building — part of the remaking of the Scripps Memorial Hospital campus. 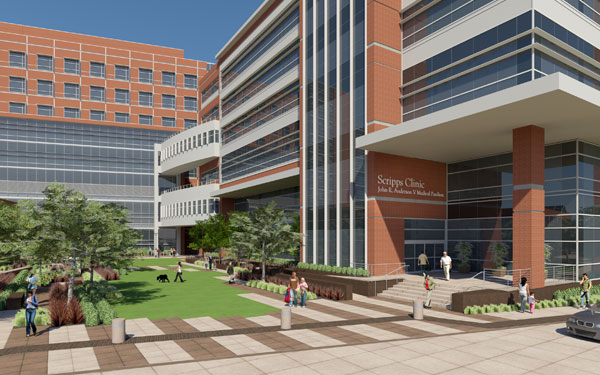 The $175 million Scripps Clinic John R. Anderson V Medical Pavilion will be used for specialty services like cardiology, gastroenterology, pulmonology, neurology, nephrology and endocrinology. The building, slated for completion in 2016, will also include four catheterization labs that will allow physicians to perform certain cardiac procedures in an outpatient setting. 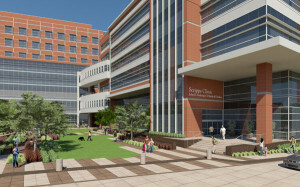 It is named for the son of longtime Scripps Health supporters Eileen and John “Jack” R. Anderson IV, who donated $25 million toward construction. John R. Anderson V, a Navy veteran, died of melanoma 10 years ago. The elder Anderson and his wife have also supported programs at Scripps Clinic and Scripps Green Hospital. He is a retired Pasadena structural engineer who invented a form of pre-cast concrete construction that became an industry standard, according to Scripps Health. “We are extremely grateful for the long-standing philanthropic support of the Anderson family, and this latest gift will create a lasting legacy for generations to come,” said Chirs Van Gorder, Scripps Health president and CEO.